please call 01743860881 for our latest deals including 2 for £25 from 2 pm April – October. The ideal Society Day venue – Our Professional staff led by Head Professional, Glyn Sadd, will be more than happy to make your day at Arscott Golf Club a memorable one. Both the individual golfer and Societies are made welcome at Arscott Golf Club and we have a variety of packages to suit all. We serve a full Clubhouse menu seven days a week. 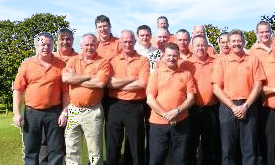 Golf Societies can take advantage of our special great value menus. If you require anything specific please let us know and we will be pleased to tailor a package to your requirements. Your club remains a firm favourite with my members, both on and off the course. Thanks for your excellent food, facilities and staff. Another great day, thanks for your help, we will be back next year for our twelth visit. We all thoroughly enjoyed the course, which was in excellent condition and a number of our members have already said they will be coming back again to play. Played Arscott first time in 5 years, extremely impressed with the maturity and condition of the course. Still plenty of water, the views are still stunning and the growth of the trees has made the course more challenging. Warm friendly atmosphere in the Clubhouse. Definitely worth a visit.